Home / Uncategorized / The bigger they are…. I am still numb! 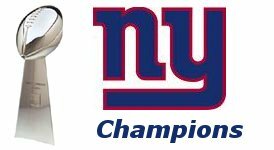 The New York Giants are Super Bowl XLII champions! AMAZING. What an incredible game, what an incredible season and post season! Eli and company came and beat up Tom and the Patriots. As a football fan, I know how incredible a perfect season would have been but as a New York fan, it was great to see the Patriots get their butts kicked. Oh how the mighty have fallen! Super Bowl championships do not happen very often so I am simply going to sit back and enjoy this one!